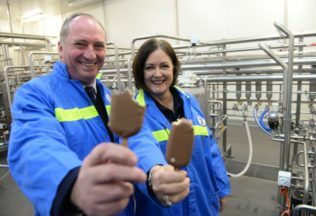 Deputy Prime Minister Barnaby Joyce has visited Bulla Dairy’s factory in regional Victoria in support of the company’s decision to start using country of origin labelling before it becomes compulsory. Bulla has committed to 100 per cent country of origin labelling (CoOL) compliance one year ahead of the 1 July 2018 mandatory deadline. Allan Hood, Bulla CEO, said the company is committed to increased labelling reform for greater transparency. “As one of Australia’s largest family owned dairy companies, we are proud to be leading the way to the new CoOL reforms in our category,” Hood said. The new Bulla CoOL packaging will start appearing in supermarkets on its vanilla ice cream tubs from September 2017.